This Yummy Cupcake Filling is perfect for all your cakes and cupcakes. It is so simple to make and tastes absolutely amazing. It comes together quickly, and adds the perfect flavor and texture to your cake and cupcakes. Sorry that all of this is stuff from Camden’s birthday party. I just want to make sure I have these recipes in one place so I can use them again. I found this recipe at Evil Shenanigans. I thought this filling was really good in cupcakes. Jared said it was better than the filling in Hostess treats. I actually agree with him. It is so thick and creamy, and adds the perfect flavor and texture to any cupcake. You could also make this with a cake, and make it a layer between the cake. It is so yummy and easy to make. could i replace the shortening with another ingredient? For this recipe, we call for shortening. We also highly recommend using it in this recipe for the texture purpose. However, you could replace it if you didn’t have any on hand, or don’t prefer the taste. Most people switch out shortening for butter or margarin. The ingredients are also straight across, meaning you don’t need more or less butter or margarin, to replace the shortening. Most people choose to use butter instead, because of the flavor, but margarin would also work great. Be sure the butter or margarin is not melted, but at room temperature. Keep in mind, your filling won’t be the same texture or flavor if you use butter or margarin to replace the shortening. For this reason, we highly recommend using the shortening. would the filling taste good with a white cake mix? I love this filling, because it pairs perfectly with any cake mix. You could definitely use a white, yellow, or vanilla cake mix for this recipe. You could honestly use it in any cake mix flavor. Funfetti, strawberry, lemon, or cherry chip would also be delicious with this filling. These Spooky Spider Cupcakes are fun for Halloween or birthday parties. 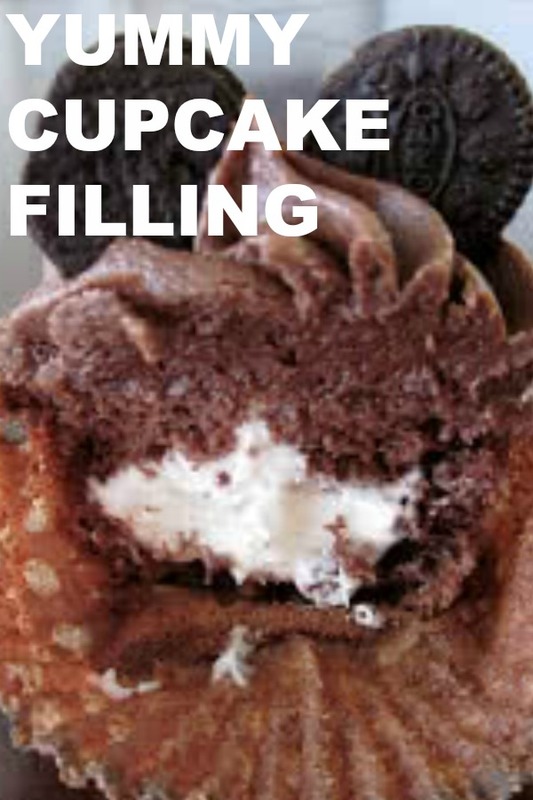 They would be even more delicious with this Yummy Cupcake Filling recipe. Dissolve the salt in the hot water and allow to cool. Whip the marshmallow cream, shortening, powdered sugar, and vanilla until it begins to get fluffy. Add the water and whip well. My mouth is watering just looking at this picture!!!! This is super yummy. I've been making this for filling for years now.